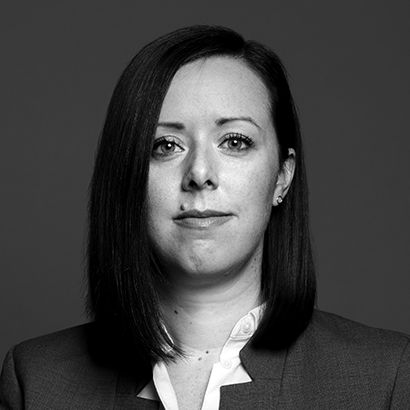 Kaitlin* is a scientist turned lawyer with a broad intellectual property litigation practice. By combining her diverse legal experience and scientific background, she achieves§ creative solutions for her clients. With a PhD in experimental medicine, Kaitlin tests boundaries and experiments with ideas to find the right balance‡ of science and law that will win the day. An avid surfer and skier, Kaitlin applies these same principles as she races across land and sea. .
Kaitlin's practice encompasses a broad range of intellectual property litigation, including ­pharmaceutical and biologics patents, food and drug regulatory, oil and gas, and telecommunications. Prior to joining Lenczner Slaght, Kaitlin summered, articled and practiced intellectual property law at an international firm. Kaitlin also provided pro bono criminal representation to members of the Toronto community. During law school, Kaitlin worked as a research associate in the Centre of Genomics and Policy. She also volunteered at the McGill Legal Information Clinic and the Concordia Legal Information Clinic. Prior to law school, she completed her B.Sc. in Molecular Biology from the University of Guelph, her M.Sc. in Microbiology and Immunology and her Ph.D. in Experimental Medicine from McGill University. Kaitlin's doctoral research focused on establishing a scientific basis for innovative and alternative therapies to viral infections. She has extensive research experience in molecular biology, biochemistry, and infectious disease. Kaitlin Soye authored the section “Motions to Inspect Documents or Property” in Chapter 22 of the LexisNexis publication, Intellectual Property Litigation – Forms and Precedents. Kaitlin Soye is the co-author of the article “In vitro inhibition of mumps virus by retinoids” which was published by the Virology Journal. Kaitlin Soye is the co-author of the article “Genotype-driven recruitment: a strategy whose time has come?” which was published by BVM Medical Genomics. Kaitlin Soye is the co-author of the article “RIG-I is required for the inhibition of measles virus by retinoids” which was published by PLoS One. Kaitlin Soye co-authored the article “In vitro and in vivo cleavage of HIV-1 RNA by new SOFA-HDV ribozymes and their potential to inhibit viral replication” which appeared in RNA Biology. Kaitlin Soye was a co-author of the study “Inhibition of HIV-1 expression and replication by SOFA-HDV ribozymes against Tat and Rev mRNA sequences” which appeared in Retrovirology. Kaitlin Soye was a co-author of the article “Small interfering RNAs against the TAR RNA binding protein, TRBP, a Dicer cofactor, inhibit human immunodeficiency virus type 1 long terminal repeat expression and viral production” which appeared in the Journal of Virology.